In 1970 the first Earth Day paved the way for the creation of the EPA and passage of the Clean Air Clean Water and Endangered Species Acts. CP Lab Safety is also dedicated to preserving our Earth's precious resources. Here are a few ways to minimize your home and office waste while saving money at the same time. Keep the water turned off while brushing your teeth, washing dishes, or washing your hands. You can save 13 gallons of water every day by changing your habits! Reuse your grocery bags and eliminate plastic bags. Hundreds of plastic bags are thrown away every second in the USA. Just one reusable bag has the potential to eliminate 1000 plastic bags over its lifetime! Still, plastic bags are better than paper for sustainability, so reuse your plastic bags, or invest in a reusable cloth bag, the very best choice! Line dry your clothes instead of putting them in the dryer. You'll save money and energy! You'll notice an immediate savings in your utility bill, and your clothes will be sunshine fresh. Plus, line dried clothing lasts longer due to the more delicate handling, so you conserve many different resources with this one simple change. Plant a tree outside your hottest windows. Trees absorb carbon dioxide and produce shade which can lower your energy costs 10-15%. Make sure all of your windows close properly and that the attic in your home is properly insulated. This can save you big bucks on your energy bill. Also, keep your heating and cooling systems properly maintained, and switch to reusable filters when possible. Make sure your tires are properly inflated for the season to improve your gas mileage up to 3%! Every gallon of gasoline saved keeps 20 pounds of carbon dioxide out of the atmosphere. Turn down your water heating settings (just 2 degrees will make a significant savings!). Additionally keep the thermostat 2 degrees higher in summer and 2 degrees lower in winter and invest in a programmable thermostat. Every degree of lowered heat in the 60-degree to 70-degree range saves up to 5 percent of heating costs. Fill your dish washer and washing machine with a full load - this will save you water electricity and dish detergent. You can often choose a rinse and hold option on dishwashers in between full loads. Do your weekly shopping in a single trip to save fuel and reduce emissions. And window shop! If you have the urge to spend, try window shopping or browsing first. This helps ensure you are only buying things you really need, or really want, and you're not just impulse buying. Remember, every item in a store, no matter how small, has a footprint, so if we are conscious consumers, we can reduce our own footprint and the overall footprint of our nation. Ride Public Transportation when possible and available and drive slower when you have to take your car; driving at 50 miles per hour saves gas and reduces carbon dioxide. Buy fruits and vegetables that are in season rather than depending on those that are flown in from halfway across the globe. Americans put almost the same amount of fossil fuels into our kitchens as into our cars. In fact it takes about 400 gallons of oil per person a year to grow raise and transport our food. When possible, buy organic or "fair trade." There's a better chance the food was grown in an eco-friendly way, and if it's locally grown, it didn't have to travel that far. This also goes for those double lattes... coffee often has a large carbon footprint because of the distance those beans had to travel to get here, and how they were produced. Try eating at restaurants that serve locally produced or seasonal foods. Pay attention to packaging. When out shopping, try to go to stores or co-ops that keep packaging to a minimum. For example, you may chose to buy the loose tomatoes rather than boxed or plastic-wrapped tomatoes. Also, take reusable bags to the grocery store. When it comes to resources, plastic is better than paper, but a reusable cloth tote-style bag is better still. Reduce your meat consumption to help cut greenhouse gases. Raising animals for food generates more greenhouse-gas emissions than all the cars trucks trains ships and planes in the world combined. Eat lower on the food chain. If each one of us ate one meat-free meal per week it would be the same as taking more than 5 million cars off our roads. Use reusable cloth towels instead of paper towels to help reduce deforestation reusable containers instead of plastic baggies and reusable bottles to save oil. Purchase a reusable water bottle and make a habit of using it. The total amount of energy required to make a bottle of plastic water is equivalent to filling that plastic bottle ¼ full with oil. Producing all the bottled water consumed in the U.S. requires more than 17 million barrels of oil! If you must buy bottled water in the U.S. avoid water from distance countries like Fiji and Italy. Shipping water from afar has high "carbon cost." Replace regular incandescent light bulbs in your home and office with high efficiency CFL bulbs. Make it a policy to buy Energy Star-rated light bulbs and fixtures which use about 75% less energy than the standard bulb last up to 10 times longer and save about $30 per bulb in electricity costs over their lifetime. If every American home replaced just one light bulb with a compact fluorescent light bulb (CFL) it would be like taking 800,000 cars off the road! Reduce your waste! The average U.S. office worker goes through 10000 sheets of copy paper a year. Make it a habit to print on both sides or use the back side of old documents for faxes scrap paper or drafts. Avoid color printing and print in draft mode whenever feasible. Turn off your office machines and lights at the end of the day. Install timers or motion sensors that automatically shut off lights and machines when they're not needed. Unplug electronics that are not in use. Nearly 75% of the electricity used to power your small appliances and electronics is consumed when the appliance is in stand-by mode – in other words turned off but still plugged in silently sucking up electricity. Avoid improper disposal of electronic waste (computers battery etc) paint chemical oil waste all of which damage the environment and can be disposed of legally and safely with a quick call to your sanitation department. Does your open waste container make you fume? If you work in the laboratory pay special attention in avoiding evaporating waste solvent in the fume hood. 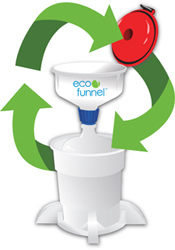 Use ECO Funnel® to prevent toxic fumes from evaporating out of your waste containers. CP Lab Safety specializes in varieties of the ECO Funnel® that will help you reduce your laboratory pollution.